If you struggle with your materials falling apart at the seams — and you know the problem is with your thread instead of the fabric — you may have an issue with your seam strength or durability. This can be affected by your thread's fiber type, size, finish, or construction. Because all of these factors can affect your seam strength, it is important to use high-quality threads for all of your materials. But how do you calculate seam strength to see if your thread is strong enough for what you need it to do? You will need to know a few things before you get started. You need to know the stitch type (301 lockstitch or 401 chainstitch), stitches per inch (SPI), and thread strength which is usually measured in pounds. A seam is only as strong as its weakest link, so it is important that you are using the same size threads for both your needle (top thread) and looper (or bobbin) when using the following calculations to get the most accurate estimate. 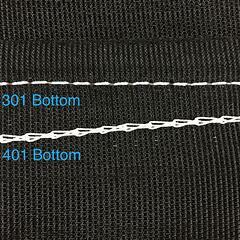 An example of this using a Bonded 207 Nylon with 35 LB Tensile strength, with a 401 Chainstitch, would be calculated as, 5 SPI x 35 LB x 1.7, which would equate to an approximate seam strength of 297.5 LB's. Although many people only think about the fabric used in any product, it's important to remember what holds it all together: the seam. 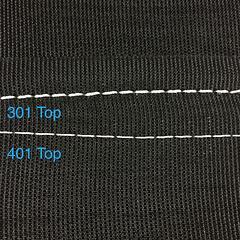 The integrity of the fabric is extremely important but if your thread is not high quality, neither is your product. That is why it is so crucial to always use the best thread available for each product. In any case, there you have it! That is how you can calculate your seams' strength. If you need assistance determining the best industrial sewing threads for your sewing machine and application, please let us know!